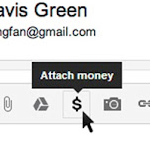 One of the cooler new features of both Gmail and Google Wallet that didn't make it into today's three-hour Google I/O keynote is the new ability to send money to any Gmail contact. Just message or reply to someone, write something along the lines of "here's your money, dog," and click the Attachments paperclip icon. You'll see a new option among the expanding icons: a dollar sign. Click the dollar sign, and you can send funds straight from Google Wallet. You can literally attach money to an email. How cool is that? Of course there are a few restrictions. At the moment you can only send money via Gmail on the desktop, and you need to have either credit in your Wallet account or a linked funding source. This only works for Gmail users that are verified as 18 or older - kids, don't try to reenact Blank Check. Interestingly, it doesn't look like the receiving party has to have Wallet for you to send money (they don't even need to be a Gmail user) though they'll certainly have to set up a Wallet account to claim the money and transfer or spend it. Only U.S. transactions will be supported initially, and everything's covered under Wallet's existing Purchase Protection. The Google Commerce blog post says that the "Send Money" feature is being rolled out over the coming months, so don't be surprised if you don't see the dollar sign icon in your Gmail window today.